Sports fans were less than pleased about Saturday's sporting coverage on television, as Channel 5 launched its new football league highlights show to less than complementary feedback on social media. And amidst a live TV coverage blackout the other side of the Irish Sea, Irish rugby fans had to find workarounds in order to watch their national team play Wales in the team's first of four Rugby World Cup warm-up matches. Meanwhile, BT Sport viewers complained about matches being spoilt by on-graphic graphics surrounding the action on the pitch. 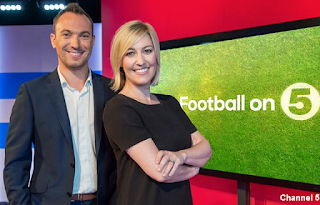 Football League Tonight, Channel 5's new weekly prime-time football league highlights programme fronted by George Riley and Kelly Cates debuted with harsh criticism of the show online. A lack of highlights, the inclusion of an audience and 'wooden' presenters made the official #footballon5 hashtag trend on Twitter for all the wrong reasons. Dear #footballon5, we just want to see the goals. Please drop the sub-Top Gear audience-based banter-fuelled twattery. Thanks, the fans. Predictably, the lack of an HD version of Channel 5 on free-to-air services was also complained about. Meanwhile, sports fans the other side of the Irish Sea faced a TV blackout of coverage of their national rugby team's game in Wales. None of the main Irish broadcasters provided live coverage on TV, so viewers ended up having to find workaround solutions. Thousands searched for manual tuning details for BBC One Wales, so they could add the channel with the live coverage on their Sky or free-to-air satellite receivers. Other users resorted to using VPNs in an attempt to view the BBC Sport live stream via the BBC Sport website or the iPlayer. Highlights of the game, which saw Ireland beat Wales were shown several hours later on RTÉ 2 and Sky Sports 3 in the Republic. This is what live coverage of French football looked like on the BT App. BT Sport didn't escape unscathed from the ire of sports fans. 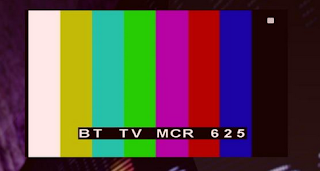 Users of the BT Sport App who were trying to watch Marseille v Caen live found they got a testcard labelled "MCR 625" instead of the actual match. And viewers with BT Sport Europe complained about football matches being spoilt by on-screen banners, which some said were like Sky Sports News, surrounding the action on the pitch. Just wish BT would drop the silly huge onscreen logos and make em smaller! That would be a start! Saw that mess on C5 over the weekend, it was a shambles!